The Infiniti is a high-end luxury vehicle that drives and handles like a sports car. Superior driveability, speed, and comfort are the main ingredients to your Infiniti’s peak performance. Our team of Infiniti service experts want to get you behind the wheel of the vehicle you expected. Preventative maintenance is what keeps your Infiniti in high gear. Efficient oil change intervals are vital to your engine’s strength and longevity. Come to us for any of your Infiniti’s oil changes, tune-ups, engine diagnostics, pre-purchase inspections, or lube services. Infiniti manufacturers passed the “baton” to you when you purchased your Infiniti. You should now partner with Precision Auto, your local Infiniti service experts, to get the greatest return on your investment. Smart Infiniti drivers in Germantown, MD choose Precision Auto as their service provider. Together, we can turn your driving experiences into everything you see in the commercials. Precision Auto’s team is helping turn Infiniti drivers into road warriors and luxury motorists. Enhanced driving experiences are possible because of our advanced auto service technology. We stay abreast of all the latest innovations and technologies to make sure your vehicle is receiving the highest service standards. When drivers push their Infiniti too far, a repair need might arise. It’s comforting to know you have an expert close by. 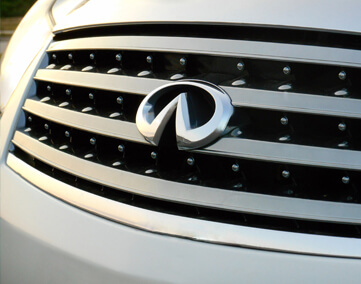 Precision Auto is the preferred destination for any of your Infiniti services. We offer the same expert-level services as the dealerships, except we don’t charge you an arm and a leg. You’ll driving away feeling like you were treated like family, not just another number. Bring us your Infiniti for anything from routine oil changes to complicated transmission services. We handle it all using the most advanced technologies and equipment. The same excellence that our techs use for major repairs, we use for minor repairs. We’re committed to maintaining your Infiniti’s performance excellence. Our ASE Certified techs handle engine repairs, transmission repairs, exhaust system repairs, air conditioning repairs, steering and suspension repairs, brake repairs, tire repairs, and any other repair service from bumper-to-bumper. Keep our experts on speed dial whenever you have a malfunction with your vehicle. We’re highly skilled and can probably diagnose your vehicle over the phone. But we’re too experienced to let that be the final word. All the correct answers and repair solutions will come after you visit our facility. Schedule Your Infiniti Service Today! Precision Auto in Germantown, MD is ready to enhance your Infiniti driving experience with top-notch maintenance and repair services. We want your Infiniti to reach its potential, and stay there. You imagined a higher standard for engine performance and that’s exactly what our services will give you. Give us a call today at 301-917-2682 to schedule your next Infiniti service appointment. You can also save time by using our convenient online scheduling system right now! We’re looking forward to improving your Infiniti’s overall performance.